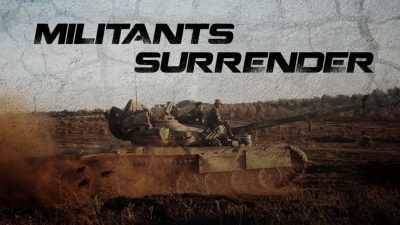 The defense of non-ISIS militants in southern Syria has fully collapsed under pressure from the Syrian Arab Army (SAA), the Tiger Forces and their allies. Government troops have liberated al-Shaikh Sa’d, Tell al-Bahsa, Tell Ashtara, Khirbat al-Tira, al-Sukariyah, Qrqus and Tell al-Jabiyah mostly taking control of these areas accepting surrender deals from members of the Free Syrian Army (FSA). According to pro-government sources, members of Hayat Tahrir al-Sham (formerly Jabhat al-Nusra, the Syrian branch of al-Qaeda) and the FSA have fully surrendered to the SAA and a radical part of them has accepted an evacuation agreement. Under the agreement, the militants will hand over all of their weapons to the SAA and get an open corridor to move to the militant- held areas in the provinces of Idlib and Aleppo. Additionally, the militants will hand over two observation posts near the villages of Umm Batinah and Ruwayhibah, inside the demilitarized zone, to the United Nations Disengagement Observer Force, established by UN Security Council Resolution 350 on May 31, 1974 to separate Syrian and Israeli forces. Despite this, units of the SAA and the Tiger Forces still have lots of work to secure the rest of the areas, which are still formally controlled by militants. According an SAA source contacted by SouthFront, government forces and moderate members of the FSA are now actively coordinating their efforts over the developing reconciliation agreement. Their key concern is to prevent attempts by the ISIS-linked Khalid ibn al-Walid Army to use this situation to launch own advance expanding areas under the group’s control in southern Syria. Meanwhile, in the province of Idlib, up to 6,500 civilians and members of the local National Defense Forces have been evacuated from the besieged government-held towns of al-Fu’ah and Kafriya. According to pro-government sources, at least 160 buses and 10 ambulances have been involved in this effort. Al-Fu’ah and Kafriya are the core of a government-held, which has been under siege of HTS and its allies since March 28, 2015. Currently, the SAA has no free resources to carry out a needed large-scale military operation to link up this area with the government-controlled part of Aleppo province. Therefore, Damascus has used a recently opened opportunity to evacuate the besieged civilians and NDF members. The another side of the story is that this decision will de-facto transfer control of al-Fu’ah and Kafriya to HTS.